I’ve been playing around on Tinder lately. If you’re not familiar with it, it’s a dating app that distills online dating to its essence: Look at a picture of a potential match, swipe the picture left for no, right for yes. If they swiped right for your picture too, you can communicate with each other. It’s entertaining, in a way: it requires very little effort – less effort than Candy Crush, which is the other app I use when I have time to kill. I’m having better luck advancing levels on Candy Crush than I am in advancing my love life. The problem with something that requires so little effort, of course, is that most people put very little effort in. In my zip code, fully half of my prospective matches – no, I didn’t count – have no text on their profiles at all. Half of the available men in my area have absolutely nothing to say for themselves. Of the half that do have something to say, often it goes a little like this: I like hanging out with the guys, working out, and watching sports. This is usually followed by some sort of statement of tribal allegiance (Go Hawks and/or Dawgs and/or Cougs!). I wonder where it is a woman fits into this equation, but I already know the answer. Someone’s got to make the nachos. The photographs in their profiles are usually taken at games, where they sport team logo gear, or at bars or parties, where they hold frosty mugs aloft, but either way they are surrounded by people and it is frequently difficult to determine which one I should be looking at. Some of them just cut to the chase, and use a team logo as their profile pic. Guys, if you actually were Seahawks, you wouldn’t be on Tinder. Some of them post pictures of their rides – usually motorcycles or muscle cars – and the photos may or may not have a person in them. Guys, if I needed a new vehicle, I’d go to a car dealer. Fatigue has set in, but I swipe onward: Genghis Khan without his horde, left. A kilt-wearing crossbow-toter with no face, left. Teddy Ruxpin at a urinal holding a beer, I give up. I don’t enjoy spending my time this way, so even when a guy appears – not offering any information and wanting to get together ASAP – I smell hookup, and worse, I just can’t muster up any enthusiasm in spite of his GQ-worthy profile picture. I spend my free time going to brunch or the movies with friends, or at home, watching The Sopranos (who feel like friends, so many times have I re-watched the series), or maybe catching up on Game of Thrones (who I hope aren’t friends, though maybe that’s better than having them as enemies? hard to say). I take long walks with The Red Dog and Miss Liberty, a rescue dog I am fostering. All in all, I find the time passes pleasantly this way. I make dinner for two, or often, just myself and when it’s the latter, I make what I want, exactly how I want it. This is how I ended up discovering Deborah Madison’s lovely recipe for Brussels sprouts – I had some of everything it called for, and nobody to tell me they don’t like Brussels sprouts, so I made it one evening as Tony Soprano had someone whacked in the background. Nobody was killed making this recipe, though I did burn a finger getting the toasts out of the oven. It’s wonderfully simple, and takes pan-roasted Brussels sprouts off the side of the plate – where they don’t belong – and puts them center stage. If you’re not already pan-roasting your Brussels sprouts, you’re really missing out – the sprouts lose all the bitterness and become sweet and flavorful as they caramelize. I usually just toss them in the pan with some olive oil and salt, or maybe truffle oil if I’m feeling extravagant. But Deborah Madison takes it up a notch, adding onions and smoked paprika, which elevate the whole dish to heights I had not thought possible. I redid this recipe a tiny bit: In Madison’s original, the Brussels sprouts are boiled briefly, then added to the onions. But I saw no reason for the extra step, since pan-roasting Brussels sprouts is the way to get the best flavor out of them, and if the onions caramelize a bit along the way, so much the better. So using this method, I’ve made the dish several times, each time better than the last. The original recipe also calls for sharp cheddar cheese, which would be fine. I use Beecher’s cheese, which is local to Seattle, delicious, and can be purchased in large quantities at my neighborhood Costco. Another blogger adapted this recipe somewhat and used gruyere, which would also be lovely. It’s your dinner: Use whatever cheese you please. I found the original recipe on Food & Wine; I am not sure which of Madison’s cookbooks it is from. I’ve already checked one of her books out of the library, so hopefully I’ll know soon. Heat the olive oil in a large skillet. Add the onion, season with salt and pepper and cook over moderate heat, stirring occasionally, until just softened, about 5 minutes. Add the paprika, cover and continue cooking another minute. Add the brussels sprouts to the skillet and cook, stirring only to prevent scorching, until tender throughout and browned in spots, about 10-15 minutes. Season to taste with salt and pepper. Arrange the toasts on a baking sheet and top with the cheddar. 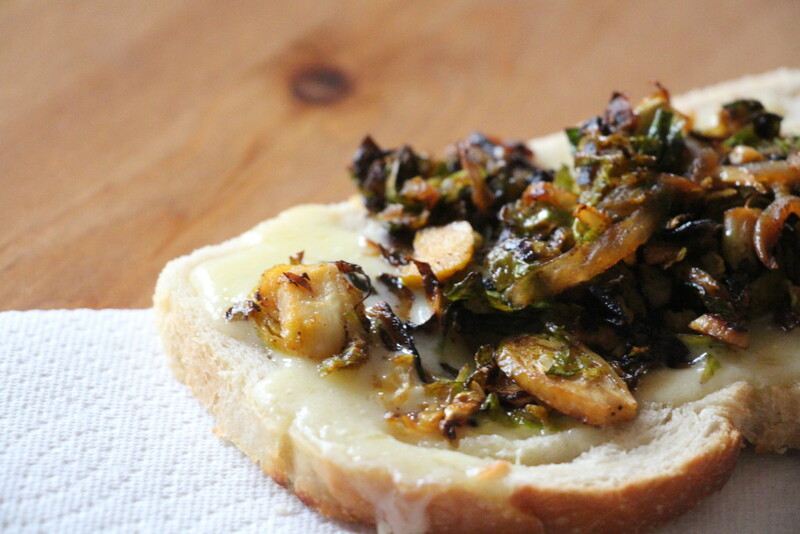 Bake for 2 minutes, until the cheese is melted; mound the brussels sprouts and onions on top and serve. An amazing thing happened this week: I lost five pounds without trying. I don’t want you to think I did something unsafe or unhealthy, or have some dangerous underlying medical issue that caused this. I don’t, and in fact, I was under a doctor’s supervision when it happened. She was weighing me as part of my annual physical. According to the doctor’s scale, I weighed less fully clothed than I did just hours before, when I got out of the shower and onto the scale The Departed left behind. This was the same scale that, when we moved in together a decade ago, I got on and remarked that it seemed to give me a higher number than my own scale. I don’t remember the exact explanation I received, but whatever the reason, I was persuaded to toss out my own inaccurate scale, while his scale remained. I debated sending the scale to him when I sent the rest of his stuff over, but he didn’t ask for it and I figured I shouldn’t have to pay for anything I didn’t have to. My mistake. My new scale arrives Monday. Of course, although losing five theoretical pounds gets me closer to my target weight – with no extra effort on my part – it doesn’t actually help my clothes fit any better, so I need to continue on my diet until an accurate scale gives me a more agreeable number and the clothes in my closet agree. I’m fine with this, as I’ve discovered the wonders of calorie-counting apps, and have had no difficulty saying No to dessert recently. The only thing I really miss is baking – it’s the part of cooking I love most – so I’ve set about finding recipes for things I can bake that aren’t cookies or cakes or The Child’s beloved tuna-noodle casserole, but that still warm my soul, as well as part of the house, at least while the oven is on. I’m getting better at keeping vegetables in the house, so this week was pleased to open my vegetable drawer and discover a head of cauliflower. In the meat drawer below – mostly used for cheese – I found half a piece of Gruyere, buried beneath the Parmesan and Parrano. 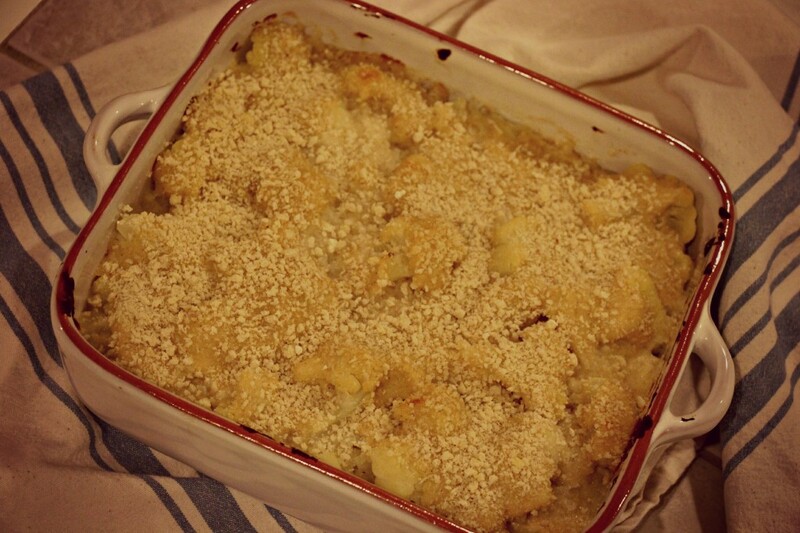 Surely, there must be a way to make a nice winter dinner out of the fridge, and it turns out there is: A nice cauliflower gratin. You could serve this as a side dish, or bring it to a potluck, much as you might with a nice macaroni and cheese, but it also works nicely as a main dish if you have some good bread to serve alongside. It’s substantial and filling, not too gooey or cheesy, with mild flavors set against a nice crunchy topping. You can make this ahead of time and store it in the fridge, then just bring it to room temperature when you’re ready to bake and serve it. It reheats well, and makes a nice lunch the next day, and the day after that. This recipe is lightly adapted from Ina Garten’s recipe. Preheat the oven to 375 degrees F. Bring a large pot of salted water to a boil. Using a box grater, grate the Parmesan and Gruyere and set aside. 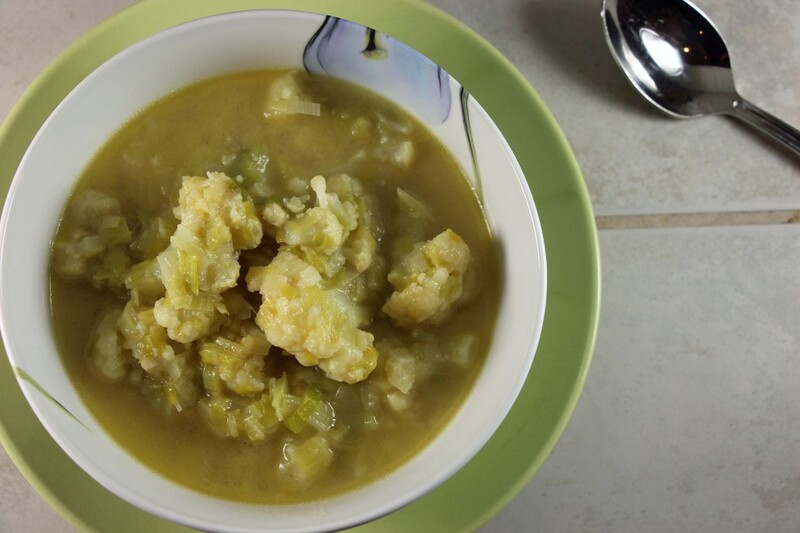 Cook the cauliflower florets in the boiling water for 5 to 6 minutes, until tender but still firm. Drain. Meanwhile, melt the butter in a medium saucepan over low heat. Add the flour, stirring constantly, for about 2 minutes, until the mixture is a light golden brown. Pour the hot milk into the butter-flour mixture and stir until it comes to a boil. Boil, whisking constantly, for 1 minute, or until thickened. Off the heat, add 1 teaspoon of salt, the pepper, nutmeg, the Gruyere, and the Parmesan. Pour ⅓ of the sauce on the bottom of an 9 by 9 inch baking dish. Place the drained cauliflower on top and then spread the rest of the sauce evenly on top. Top with bread crumbs. I eliminated some of the extra cheese and butter from the original recipe, as I didn't feel they were needed. If you feel it needs something extra, grate an additional ¼ cup of grated gruyere, and add it to the bread crumbs topping. Then drizzle this mixture with an additional 2 tbsp of butter, melted.